Worn proudly by forest fire fighters from coast to coast! 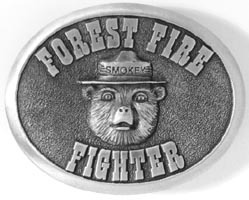 This is a durable, brass-plated buckle with Smokey in the center. Approx. 3.25"x2.5" Made in the USA.